Siphonophora is an order of colonial organisms. The most familiar species is the Portuguese man-o-war which is not a jellyfish though often thought to be one. There are about 175 different species of Siphonophore. Some of these are the longest animals in the world. They can get up to about 120-130 feet long. Most of the Siphonophores are long and thin, made up mostly of a clear gelatinous substance. Some species that live in deep water, have an orange or red digestive system that can be seen through their body. They are very fragile and will break under even the smallest amount of force. All Siphonophores are predators. They use their tentacles to catch and eat small fish and crustaceans. 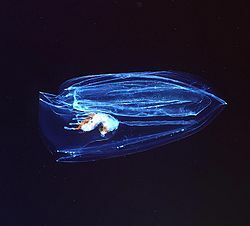 Many siphonophores are bioluminescent. The Siphonophora are made up of medusoid and polypoid zooid that are mophologically and functionally specialized. The assimilation of the zooids can be so thick that it looks like one solid mass, as opposed to several individual colonies. A zooid is an asexually produced individual of a compound organism, like hydroids or coral colonies. Individuals from the colonies are strung together. They eat small animals using their stinging cells to paralyze them and then eat them. With the stinging cells are little stalks that have a red glow on the end. These stalks twitch back in forth and attract little fish. Many marine animals have been found with blue or green flickering lights (bioluminescence) but the Siphonophora is the second marine animal found to produce a red light. The first sea animal found to produce that light was the scaleless dragonfish. All zooids in a colony come from one egg. The egg develops into a protozooid. A protozooid is a polyp that makes all the other zooids through the process of budding. The earliest part of development is unknown. When physonects reproduce; the protozooid gets longer and skinnier in the middle. Then the pnuematophore forms at the opposite end from the mouth. Then the skinny part becomes the stem for the colony. Two growth zones form at the end of the stem. The growth zones are where the stem can grow and new zooids can form. The growth zone closest to the pneumatophore creates nectophores. Nectophores mature as they are carried down the growing stem. The other growth zone is located right below the oldest nectophore, this creates siphosomes. Siphosome are also then carried down as the stem keeps growing. Calycophorans mature a lot like the physonects with a few important differences. Unlike the physonect, the the end of the protozooid opposite the mouth degenerates instead of forming a pneumatophore. In some species new nectophores bud from the base of old nectophores. But in other species they bud directly form the stem. Most of the species of calycophorans shed their mature cormidia from the end of their stem. Each cormidium has its own life, seperate from the rest of the colony. Free cormidia are also called eudoxids. The length of time the eudoxids life out in the wild is undetermined. They can't regenerate into a colony, and are only able to generate new reproductive medusae. This page was last modified on 4 June 2018, at 11:18.